This is our custom-built TRS to TRS balanced line cable (TRS is 1/4" stereo or balanced connector). Construction is Neutrik TRS connectors with Horizon Lo-Z5 cable. Neutrik connectors are some of the best connectors around. 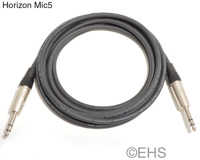 Horizon Lo-Z5 cable is very flexible, durable, heavy-weight cable. If you are on more of a budget, you might consider the Lo-Z1 cables.